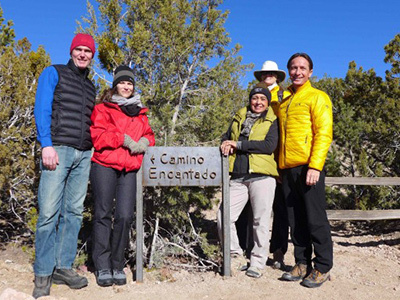 Adventure Partners and Four Seasons Rancho Encantado Santa Fe Announce Partnership. Uncover the magic of northern New Mexico using the new Four Seasons Resort Rancho Encantado Santa Fe as a luxury base. In collaboration with Adventure Partners, the Resort is unveiling a collection of signature excursions, created exclusively for guests of Four Seasons and offering a range of adventures and opportunities for immersion in the culture and history of the destination. As part of the partnership, an exclusive Adventure Center will be established at the heart of the property, set for completion later this summer. Here, guests will be able to meet with expert guides and discover the multitude of ways to explore the Land of Enchantment using Four Seasons as base camp. Prior to the establishment of the centre, guests can immediately book their adventures with the Resort’s guest services staff and Adventure Partners guides, on site daily to assist with all needs. Adventure Partners will lead a complimentary, daily guided hike – Camino Encantado – open to all guests. Hike participants gather in the lobby to walk a short distance to the 1.2-mile (2 kilometre) Camino Encantado, a historic ridge trail on the north side of the property. Guests will enjoy views of the surrounding Sangre de Cristo and Jemez Mountains, Valle Caldera, and along the way stop to learn more about the history, flora and fauna of Rancho Encantado. The departure time of the hike varies, depending on the season. Camino Rancho Encantado: This two-hour, private guided excursion through the hill country surrounding Rancho Encantado can be tailored from easy to moderate difficulty, with numerous trail options. Guests meet at the front entrance and proceed along the Resort’s ridge trail, where the colourful history of Rancho Encantado is explored. Take in spectacular views of famous northern New Mexico landmarks including the Jemez Mountains, Valle Caldera, Sandia Peak and Pedernal – forever bound to the artistry of Georgia O’Keeffe. Rising above the trail are the Sangre de Cristo Mountains, ascending above the tree line in stark contrast to the adobe hills of the Rio Grande Valley. The below tours can scheduled as a half-day excursion with additional hiking, biking and interpretive options. Downhill Mountain Bike Tour: Start at the base of Ski Santa Fe (10,350 feet/3,155 metres) and end at the doorstep of Four Seasons Resort Rancho Encantado (6,942 feet/2,116 metres), traversing ever-changing ecosystems and past commanding views along the way. Using full suspension Santa Cruz mountain bikes, begin the adventure at a spectacular overlook and enjoy a winding descent through Aspens and Ponderosa Pines, ending at the doorstep of the Resort. Rio En Medio Hiking Tour to the Waterfall: A classic Sangre de Christo walk (easy to moderate), Rio En Media is only a short 10-minute drive from the Resort. This trail wanders through a canyon supporting a wide variety of vegetation types – oak trees, choke cherries, wild hops, prickly-pear cactus, cholla cactus, rose bushes, ponderosa pine and even towering douglas fir trees. Several creek crossings and a little scrambling leads to a shimmering cascade. Tsankawi Archeological Site: Explore this less-travelled hidden treasure within Bandelier National Monument. A 30-minute drive across the Rio Grande River with a moderate walk/scramble along ancient trails takes one to a remarkable collection of petroglyphs and ancient dwellings originally inhabited in the 1400s. Formed in volcanic ash, these pueblo shelters provide excellent views of the Sangre de Cristo and Jemez Mountains, and modern-day Los Alamos. Pueblo: Ancient- to Present-Day: Begin at Bandelier National Monument, whose human history dates back more than 10,000 years, and is best known for its several thousand Ancestral Pueblo dwellings. Travel the 1.4-mile (2.25 kilometre) hike beside petroglyphs and into ancient archeological sites dating back to the Anasazi culture from 1150-1550 AD. A short drive takes participants to adjacent modern day pueblo communities to see native artisans and learn how their traditional crafts are practiced in a contemporary setting. High Road Cultural Pilgrimage: Take the back roads of northern New Mexico visiting traditional villages, most famously El Santuario de Chimayo, a significant holy place built in 1813 and thought to have healing powers. Stopping along the way, meet local artists and gallery owners, and connect with the creative spirit, history, craftsmanship and folklore of the local communities. For a short distance, the journey leaves the paved road and follows along the Embudo River drainage toward the Rio Grande and the picturesque farming village of Dixon. The return trip follows the Low Road, with short visits to ancient petroglyphs or the first Spanish capital of New Mexico, settled in 1598. Sangre de Cristo High Mountain Ramble: Drive from Rancho Encantado up the Pacheco Canyon Road to the base of Ski Santa Fe at 10,350 feet (3,155 kilometres), through aspen groves, ponderosa pines, spruce and fir. From here, stroll by seasonal mountain streams, verdant meadows and views of distant peaks. Summer wildflowers carpet the mountainside from May through September, and autumn brings spectacular golden Aspens. Santa Fe – Maverick Artists Empowered by Tradition: A tour of Santa Fe is a study of three cultures – Native American, Hispanic and Anglo. Underlying the diversity is a history of conflict, fierce independence and deep connection to the landscape. The region’s most notable artist, Georgia O’Keeffe, greatly informs the public’s perception of northern New Mexico’s art story. Explore the unique juxtaposition of Santa Fe versus Taos schools, abstract versus representational art, modern versus traditional techniques, and myriad themes helping to colour the vibrant art community of Santa Fe. Abiquiu, Pedernal and the Faraway: Journey to a landscape made famous by Georgia O’Keeffe’s abstract landscapes, with its dramatic colour palette of red rock, ash and ancient lava. Scenes of village life and religious ceremonial sites are windows into New Mexico’s expressive past. Travel along the Chama River to Ghost Ranch, O’Keeffe’s first residence in New Mexico, with views of Pedernal – her “private mountain.” The Faraway is O’Keeffe’s own name for the untouched, lonely and beautiful landscape she felt compelled to capture on her canvas.